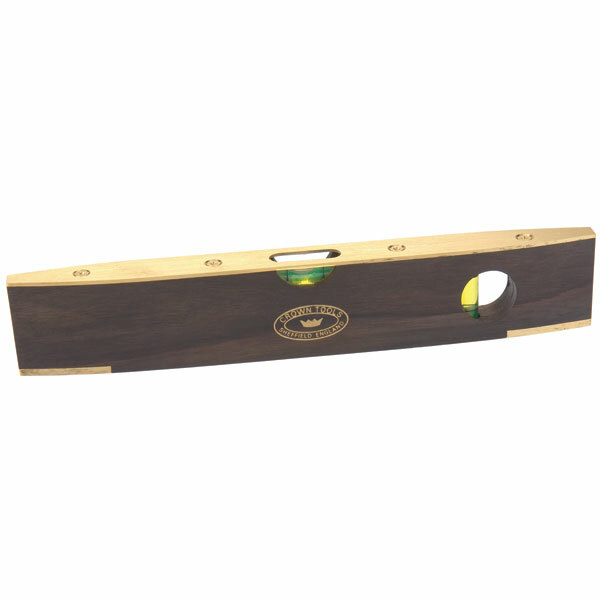 Especially when they look like a traditional tool and that is the case with this spirit level. 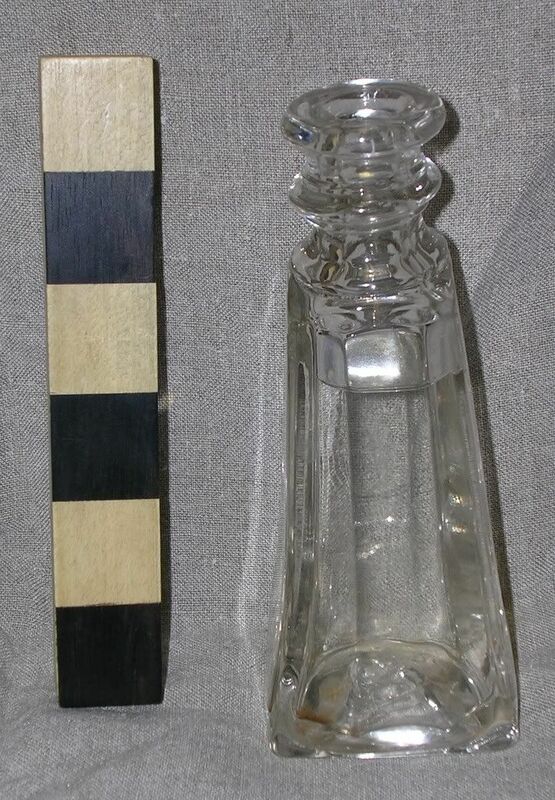 Called a ‘Whiskey Stick’, referring to the alcohol within the glass vial and kept the level from freezing in the winter time. This one I purchased on sale at my local Woodcraft. There are brass Philips screws in brass, which I will replace with the more accurate slotted iron screws. They make a smaller version that is just a level, this is both a level and a plumb, which is handy. 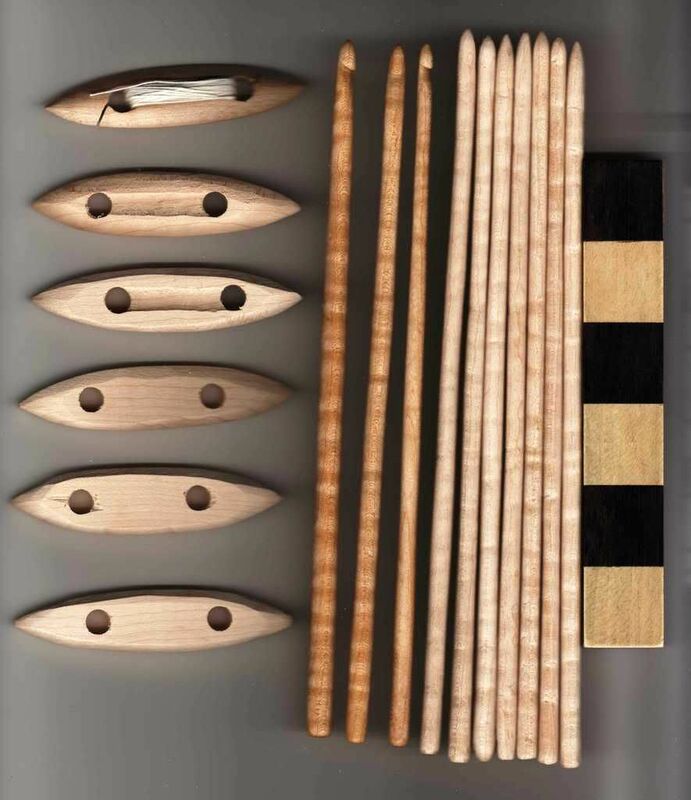 These can also be used as winding sticks, if you can read the bubble correctly. Nothing worse than being a half a bubble off level. Early packaging and shipping containers have always fascinated me. This is one from Eric Sloan’s Reverence for Wood and he shows a couple of other versions that I am going to make. 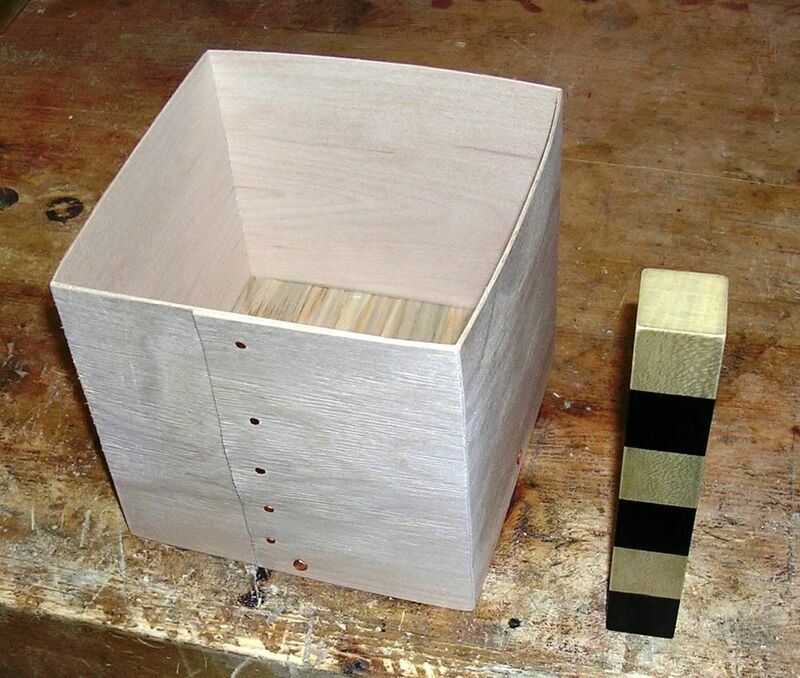 His examples are basswood, this one is maple. A friend of mine has some 1/16″ thick maple veneer and has given me some. I scored a line, cross grain in the wood with a sharp knife. 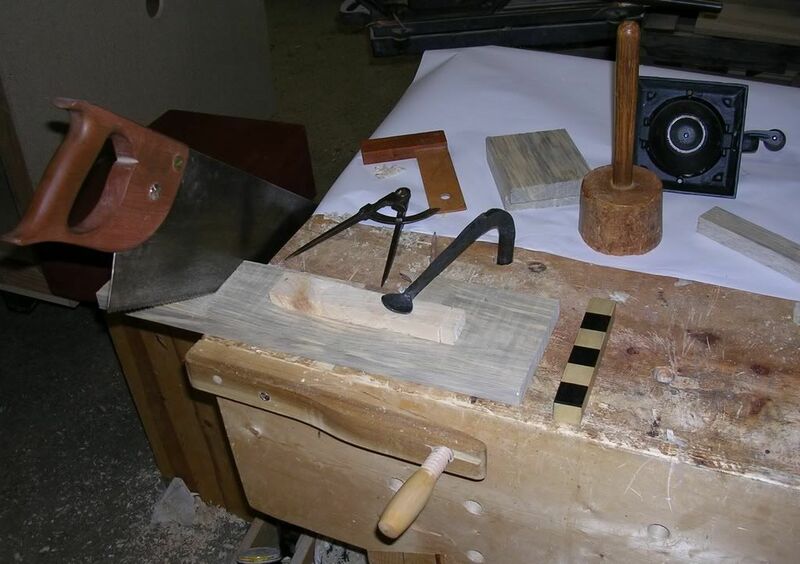 I then used a V-shaped chisel, but next time I will use a straight chisel and cut it twice per ‘kerf’. The v groove in the wood is where the wood bends. I also use a bone folder to crease the wood in the kerf after I got the wood wet. After it was wet, I bent it, next time I will heat it up, although I did use hot water to soften the wood. Once it was wet, I set it with clothes pins to hold it until it dried. When I did the layout of the box, I used the compasses to make sure the box was square. I then cut the bottom to fit. After it dried overnight, I fit up the bottom and used small copper tacks to secure the box together and larger copper tacks to secure the bottom. The thin veneer was first pierced with a square awl, then with a steel plate backing the joint the copper nails were hammered fast. When the tips of the soft copper hits the hard steel backing plate they curl and clinch the wood together. A simple box, I am going to make some more. They were probably disposible during their time period. I also have in mind a bent wood American Civil War canteen. A little bit of nothing, whittled down to a fine point. 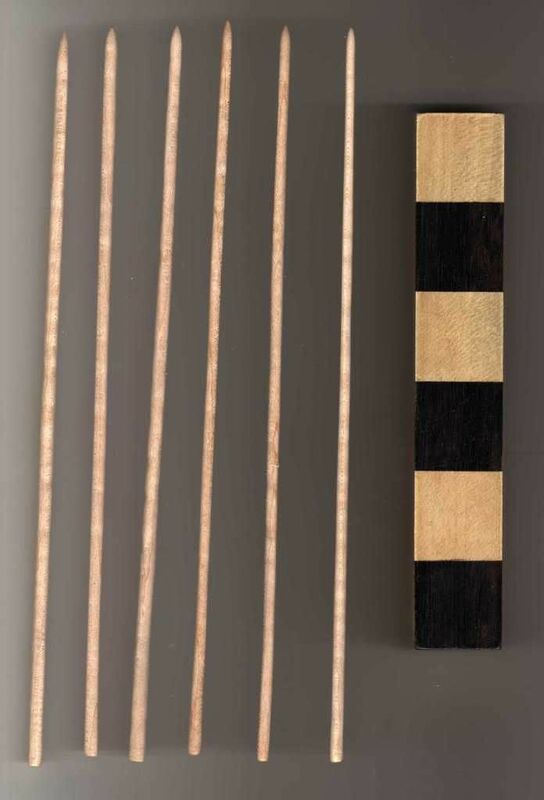 Knowing the properties of the curly maple I have been using for crochet hooks, I decided to make some smaller versions also for knitting needles. The pair on the right are 3/32″ in diameter, the others 1/8″. They were actually easy to work once I cut out the square blanks. 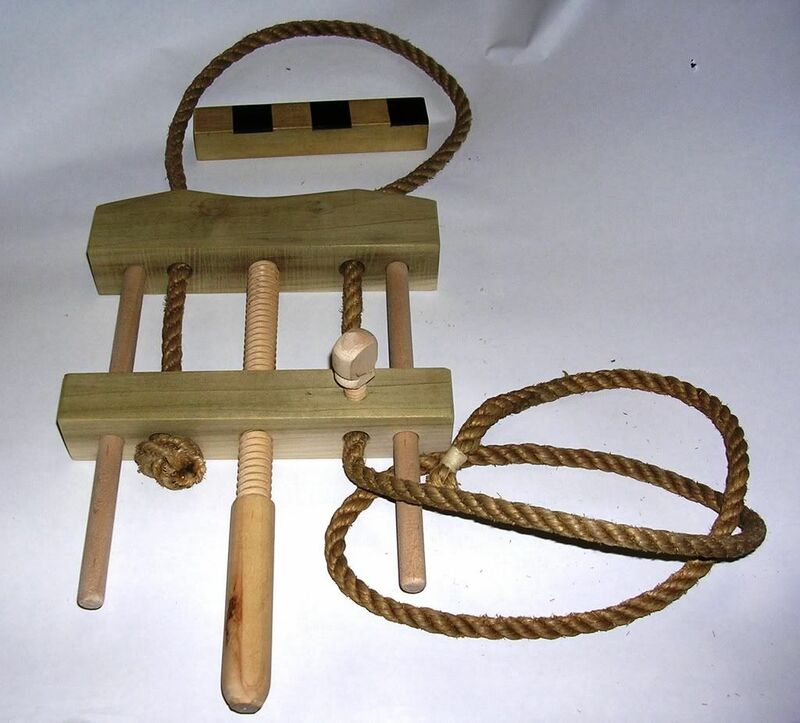 The wood was straight grained and curly which contributes properties to the wood. I shaped these with a small bronze spokeshave and finished with a card scraper. I sanded them with a piece of worn out 80 grit, then finished off with 220. I then raised the grain by getting them wet with water, then sanded again with 220. I then used a bone folder to burnish the surface. I will finish these small needles and hooks with linseed oil and a bit of glycerin to strengthen and keep them flexible. Birdseye maple is caused by crowded growing conditions and curly maple is from windy growing conditions. The grain being curly seems to be much more flexible and resilient that straight grain wood of the same diameter. I for one reason or another have a fascination for textile tools made of wood. Perhaps from having repaired so many and they are fun to make. Here are some that I am currently making for sale at This is the Place Heritage Park. I am making some other wooden objects for sale as well including hat stretchers, traveling boot jacks, writing pens, ink and other items. These are made of curly hard maple. Tatting shuttles on the left and crochet hooks on the right. Another One off the ‘List’. This is another one of those tools that I have always wanted to build. The problem was I didn’t know what it looked like. I had seen illustrations of large versions used for cooperage in Sloan and Tunis, but had not seen a smaller version. I imagined that it might be like a surgical tourniquet from the nineteenth century, but wasn’t certain. I have actually used an old brass tourniquet to clamp together a picture frame and it did work. 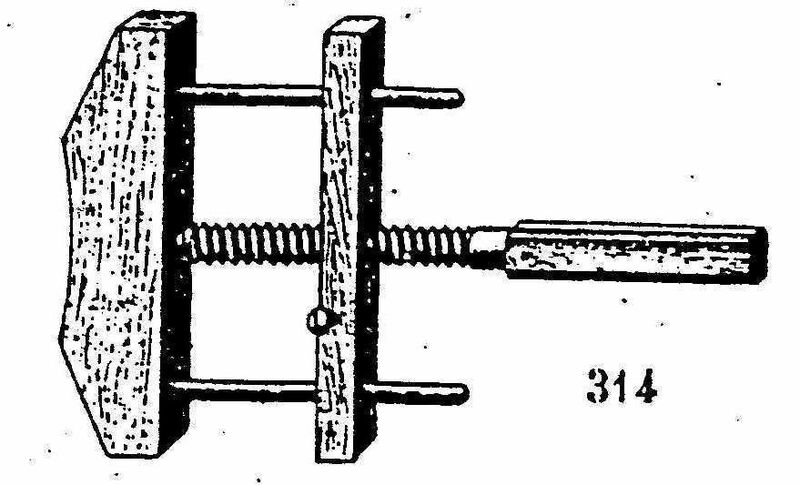 Then I ran across an engraving in a late nineteenth century French catalogue and knowing just enough French to get in trouble I figured out what the following actually looked like. I figured out what was missing and came up with the following. It was simple to make and it took less than an hour. 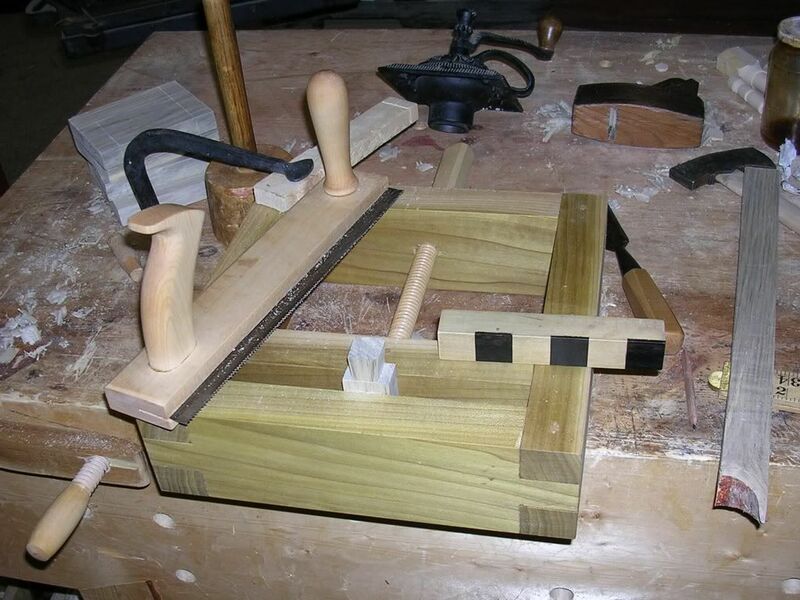 The handle was already done and I will make another one with a square (octagonal) handle to help in tightening. There is a term used by tool collectors called ‘rust hunting’. The lovely brick red glow of oxidizing iron and steel that indicates a non modern ferrous metal, delights some folks. When I go through a flea market or swap meet, I look for rust, as that usually indicates something I might be interested in purchasing. Well sometimes the rust is just rust and not worthy of consideration, so in the long and involved hunt, I have run into other objects. A few years ago I started collecting glass and it has got completely out of hand. I don’t do well with glass, I break things. And for some reason I have started collecting. Not only glass but also pottery and ceramics, and I don’t know exactly why, other that I just can’t pass up old stuff. 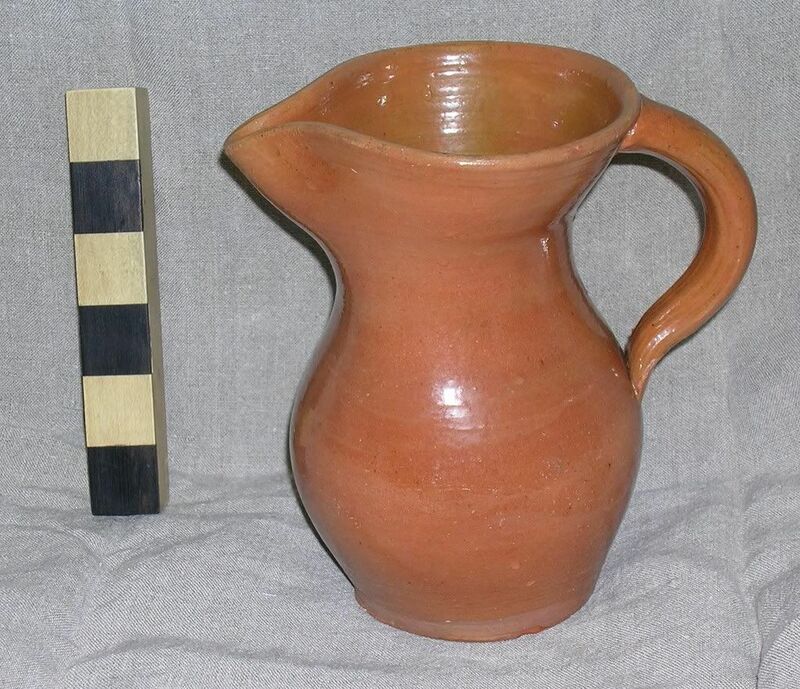 Here is an interesting Redware milk or cream pitcher, it has a great traditional shape and if it is old is remarkable condition. 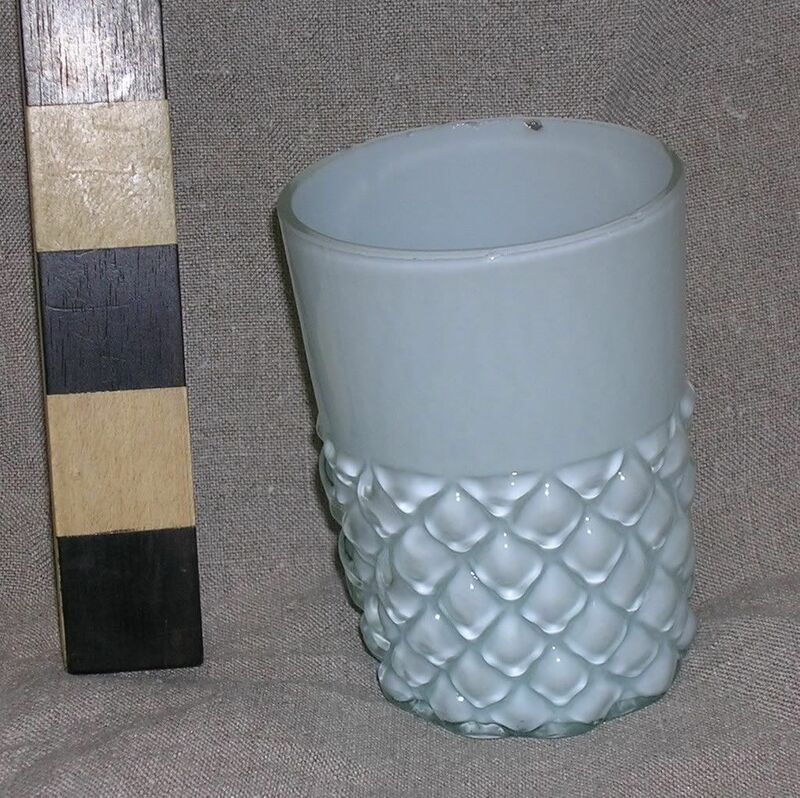 I also purchased what I called ‘a beautiful cased glass tumbler’, and I heard myself say that out loud. It is done in a three piece mold and is finished off on a pontil. The top edge is ground, has a few minor chips and the photograph doesn’t do the color justice, I can’t believe I said that out loud. However, I did find a bit of rust, albeit a deposit in the corner of a sauce bottle. Now while this just looks like a small glass bottle, when I first looked at it, I wondered how the hell did they make that shape on the inside? The outside of the bottle is square, in a nice inverted taper. The inside of the bottle is octagon. 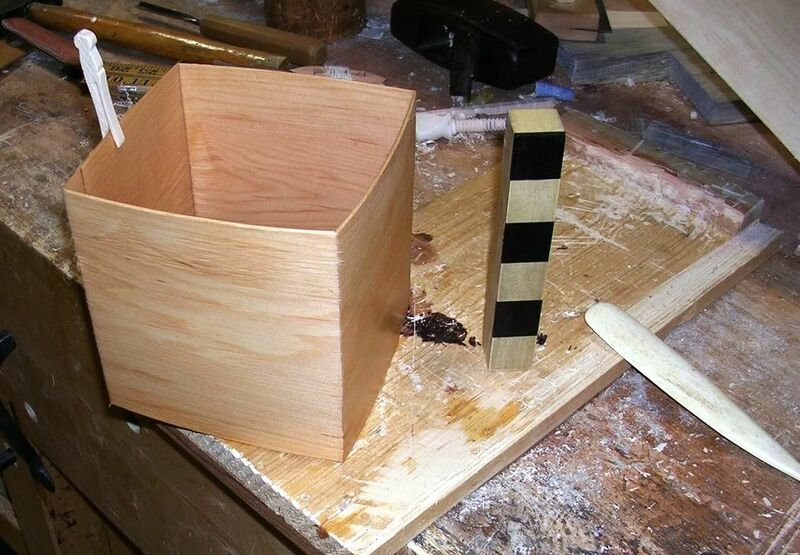 It is blown into a two piece mold, with an internal mandrel and the bottom is added on to finish. The bottom has a ‘ponty’ and is a separate piece added while still hot. This accounts for the distortion of the outside bottom of the bottle. The neck is also flame finished. Somebody went to a lot of trouble. The liquid in the bottle is white vinegar, there are some deposits on the inside plus the rust in the corner. I really would have liked to find a nice sash plane, a twist auger or old saw but if I can’t I guess I will continue to accumulate this stuff. I need a life, I need a wife. I finished up the box and drawer front. It required a bit of putty, but it is going to be painted. I originally thought of painting and graining it to imitate a fancy wood perhaps quarter sawn white oak or mahogany. I then decided after looking at it that it would look better if I just japanned the wood to make it black. I will add some gold lines to fancy it up. 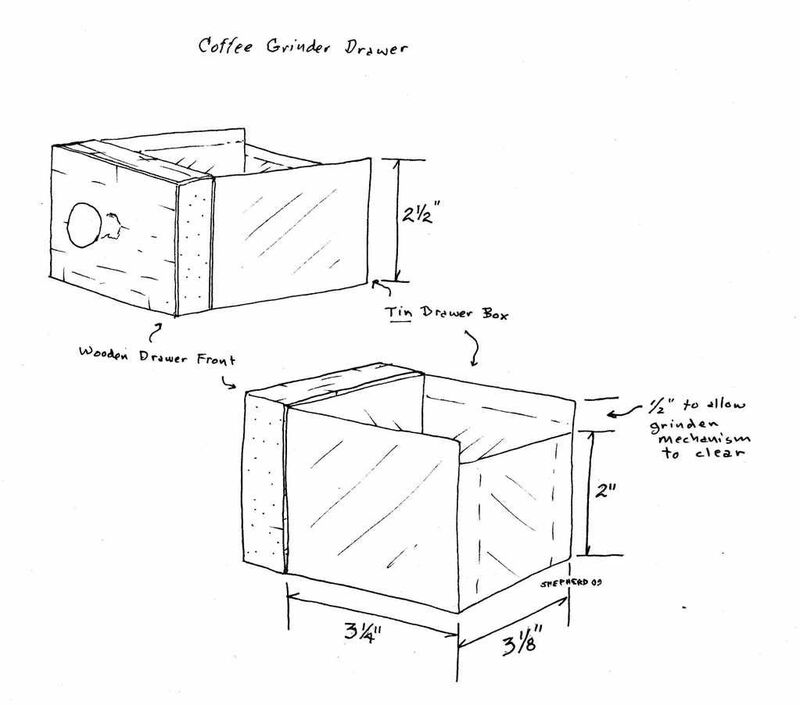 The measurements are overall outside measurements of the tin box, the seams to the discretion of the Master Tin Smith. During colonial times those types of things weren’t around as the only trading ‘partner’ was England, we couldn’t manufacture anything here, new stuff had to be imported, colonial blacksmiths could repair but legally could not manufacture. After the first war with England, those severe restrictions were gone and we were then able to import goods from England and other countries. Then protectionism and and was some may call isolationism, began to become more common and restrictions on imports considered by the government. Madison working in the Jefferson administration developed an embargo against imported goods in an effort to punish England for their practice of ‘impressment’ of American sailors, ‘Once British…’. And while tariffs were in existence earlier they continued in popularity until the American Civil War. Now why a lesson on early American economics? I think one of the main reasons that American Toolmaking started to grow and flourish was the fact that they couldn’t get cheap imports because of the embargoes and when stuff got through it was under a heavy tariff. And America was expanding and needed more tools than could be imported and with unlimited natural resources, the only problem was labor. But there was not an embargo on people, so talent from the continent began to migrate in great numbers to North America fueling the industry. The tariffs did level the playing field by causing the inexpensive items produced in countries where labor was cheap to be more competitive with items produced in North America. But the tariffs didn’t stop imports, just made them more expensive, still items like saws, plane blades, chisels and other tools made in England and considered superior to those made in North America. 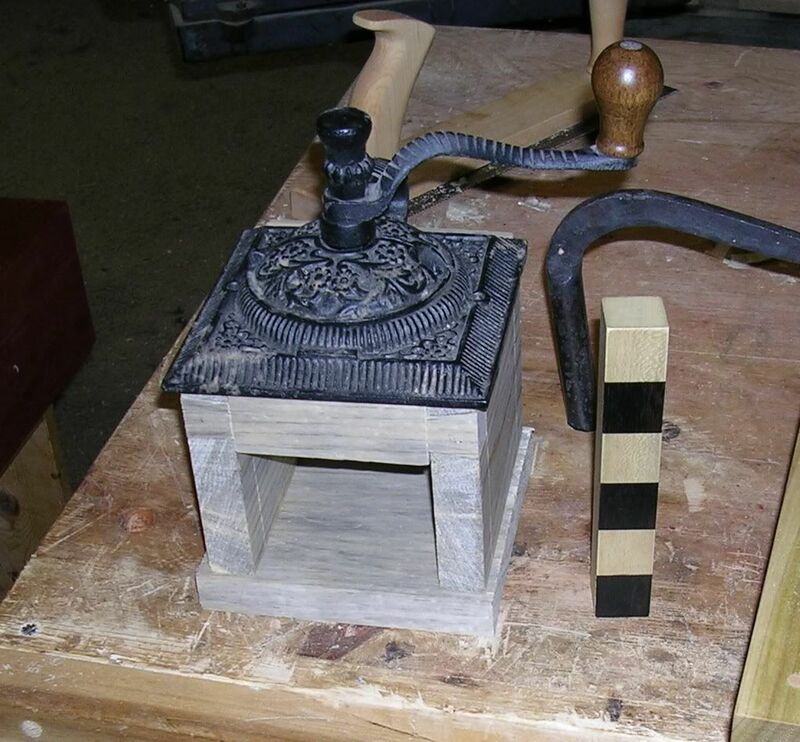 Eventually we would have gotten around to making tools here, but the politics of the late eighteenth and early nineteenth century hastened our entry into the world of toolmaking out of necessity. I am unhappy with my modern electric spinning coffee grinder, the results are fine powder and large pieces of coffee beans. 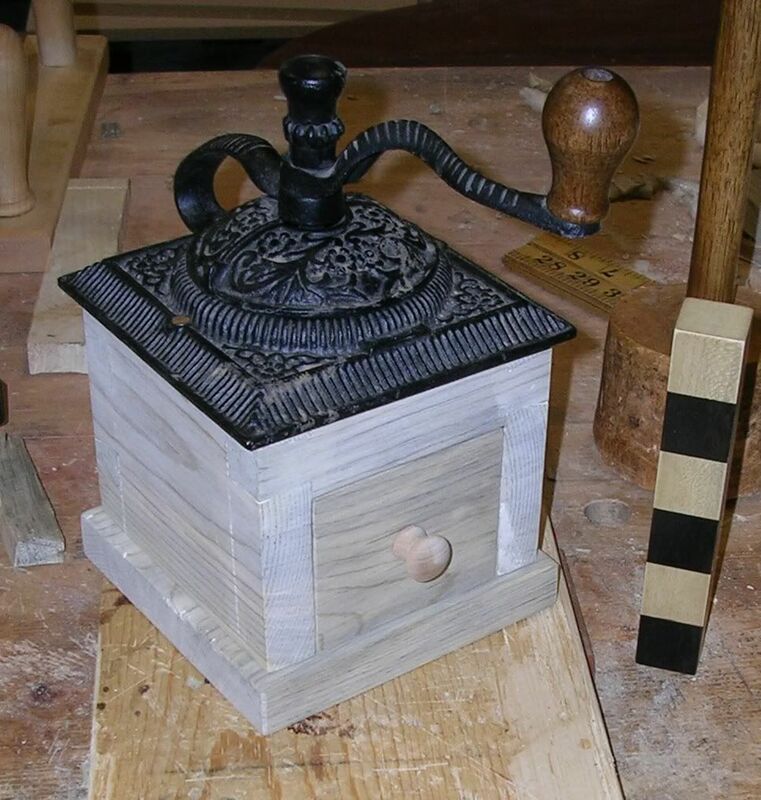 And being as I had a nice reproduction cast iron coffee grinder, I thought it was time to make a box and drawer to put it to use. 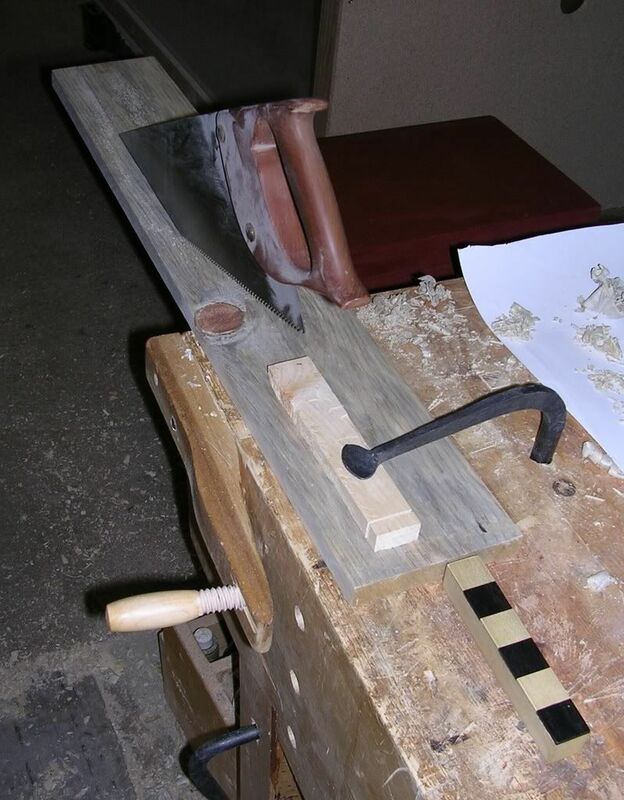 I planed the boards flat and smooth with a fore plane and shot the edges square. I cut all of the wood from a piece of blue stained pine. I ripped the board to the width I needed, I wanted the box 4 inches tall plus the base piece. The piece I ripped off, I used for the front cross piece. I set up the dividers (compasses) to the 5 inch mark, to fit the underside of the iron top and it provided a uniform measure without consulting a ruler each time. I scribed a line against a square and cross cut all of the parts. I used the tenon clamp/saw to cut the shoulders of the front cross piece as well as the pins end of the dovetails on the back of the box. That is a handy tool, but it wouldn’t cut all the way to the depth I needed, so I did that with a crosscut saw. I need to make the drawer to hold the grounds, but that will have to wait. What was available in 1807? This is a newspaper advertisement from Connecticut in 1807. Note that the paint colors come in hogsheads, barrels, casks and cases, etc., as paint in the nineteenth century was sold by the pound. It was therefore a powder pigment which was made into paint by adding linseed oil, turpentine and other ingredients. There are also shellac, copal and other gums and resins for making shellac and other varnishes. As you may note there is no mention of milk.